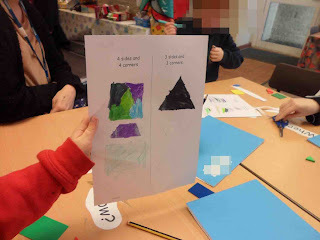 This week we have been doing lots of work with 2D shape. We've been naming all the different shapes that we know, and describing shapes using the correct vocabulary, such as 'sides' and 'corners'. 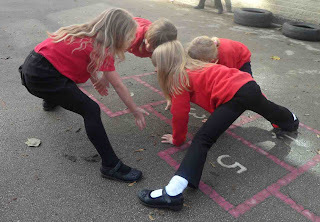 We've also been sorting shapes according to their properties... such as shapes with 4 sides and shapes with 3 sides. We played a game outside where we had to 'bust some shapes' dancing around, and then Mr Littlewood would shout a shape, and our groups of 4 would have to try and make that shape... It was easy until he shouted Octagon! 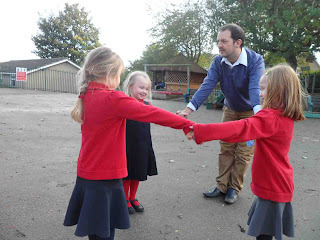 Mr Littlewood helps our group of 3 make a diamond. We also played a game called 'What's in the bag?' The bag is full of different shapes. We have to choose a shape, feel it, and then describe it to the rest of our class by using the correct vocabulary . We are all very, very good at it!.. Why not play something like this at home?